We really like PDF-X1a format with CMYK colour. Vector drawn graphics is even better for crips lines. 3mm bleed with a 5mm safe print margin. Please remove and crop or printers' marks. We don't need them and we don't want, including them is not clever or helpful and we will try and remove them before we go to print. Including them may mean we have to reject your artwork. If you're struggling to create print ready artwork then don't dispair, we can help but may have to charge a set-up/artwork fee. We can work with the majority of file formats such as jpg, tif, gif, bmp . . . they'd need to be of sufficient resolution - 300dpi is what we would ideally look for. Just got a logo? We can work with it to create a repeating pattern if that's what you'd like. We require artwork to have a 3mm Bleed and a 5mm safe print margin. So what does this mean? Let's take a sheet 500mm wide by 700mm. This is shown by the RED dotted line. This gives a full artwork size of 506x706mm. This is shown by the solid BLACK line. 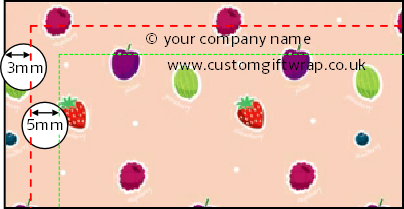 It is common to include copyright or website text in one corner close to the edge, but it must be kept a minimum of 5mm away from the edge of the finished sheet. The safe margin is shown by the GREEN dotted line. This is 5mm inside the bleed line. In this example the copyright is in danger of being cut off when the sheets are trimmed.